James J. Houlihan, curator of the Fighting Irishmen exhibition, at the Phoenix opening. Photo: Mike Moore. 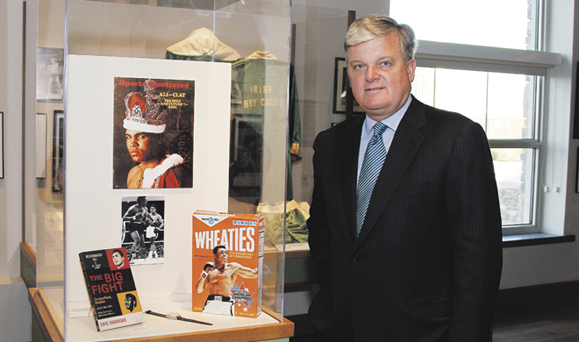 After traveling from New York to Boston and then to Ireland, the Fighting Irishmen boxing exhibition, which details nearly 200 years of Irish fighters, is now open for viewing in Phoenix, Arizona, in the recently opened McClelland Irish Library. The Phoenix opening for “The Fighting Irishmen: Celebrating Celtic Prizefighters 1820 to Present” paid special tribute to Muhammad Ali, whose great-grandfather emigrated from County Clare in the mid 19th century. Ali has several artifacts in the show, including his signed gloves and robe, and items documenting his fight at Croke Park in Dublin in 1972 with Al Lewis. The bricolage of boxing memorabilia numbers over 1,000 and includes items like John L. Sullivan’s fur coat and punching bag, and several items on loan from actor Liam Neeson, who was an amateur boxer and the Ulster senior boxing champion in the 1960s. Sullivan is famous for beating Jake Kilrain after a staggering 75 rounds in the last (barely) legal bare-knuckle boxing match in 1889. Most striking among the artifacts may be the mummified arm of Dan Donnelly. Donnelly, who was shorter than most fighters, had unusually long arms, which allowed him to strike and block against larger boxers. He became the first Irish-born heavyweight champion before his death in 1820. The Fighting Irishmen was created for the Irish Arts Center in New York City in 2006 and has been on tour ever since to widespread acclaim. It will be on display in Phoenix until May. Pat Stapleton passed away in Massachusetts 2011 or 2012. He was my cousin and he visited us for about one week in 1967. Hi Liam, yes I was over seeing your grandfather Mick this year. Hi Fred, would like to speak to you if that is ok. My email has changed from above its kesireland@gmail.com when you see this i would be happy to chat with you.